Don’t get me wrong, to compete and compete well in any sport requires a degree of commitment and sacrifice. I’ve always said if you wanted to find the toughest sport on the planet in terms of those two things all one has to do is go to any high school wrestling room. If you can survive the smell, you’re already way ahead of me. If you can survive the brutal heat, the cardio required, making weight and everything else needed in what is basically a hand-to-hand combat sport, you are part of an elite class. Wrestling is that demanding. And it’s not for everyone. Now, imagine yourself in the same sport. Imagine yourself competing in high school despite being born with disorders affecting your spine, your bowel, bladder and kidneys. Take it a step further. Imagine competing in wrestling after having roughly a dozen surgeries – including multiple surgeries lasting double digits hours. Imagine that first surgery coming within the first 12 hours of your life where you needed to be transferred from Fairmont General to West Virginia University to make sure the proper surgeon could do a procedure allowing an alternative way for essential body parts to function. Imagine that there would be more surgeries – several in fact – over the next six months to repair defects in an abdominal wall at WVU. Then imagine more, much more on the surgery front in the years ahead. Kind of hard to imagine someone going through that, battling through it, and wrestling. Bridgeport High School junior Addison Courtney doesn’t have to imagine that. What was described above was a snapshot of his life up to today. It’s the hand he’s been dealt and instead of letting it hold him down, he’s somehow managed to flourish in the most physical of sports. His love of the sport and sports in general is a family trait. If the last name sounds familiar to those following BHS wrestling it should. His father, who also happens to be a doctor at United Hospital Center, doubles as the Indians wrestling coach. The family loves sports – especially football. The Courtney family would spend Addison’s early vacations at pro games and summer camps where the youngster’s hobby of collecting autographs got started. “He always desired to play football, but knew he was never allowed to play based on his surgeon’s orders. He was actually told he could never play a sport where a major blow to the stomach could occur, which would result in a disruption to his previous reconstructions,” dad said. Needless to say, Addison was disappointed. “At that time, I was more disappointed about football. The NFL was always on and that’s what I would play in the backyard. 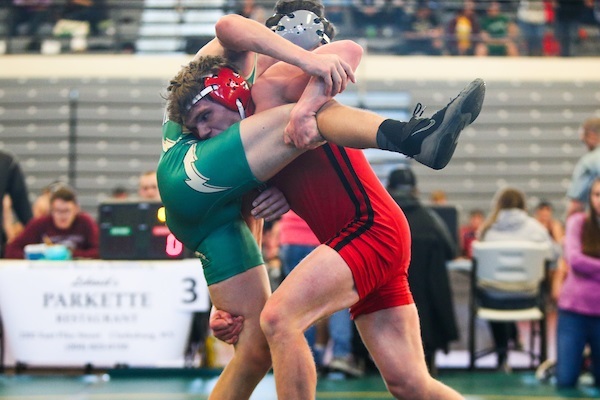 Wrestling wise, I was never in a wrestling room and didn’t know what it was about until I got involved with it even though I knew my dad wrestled,” Addison said. Competing in sports, it seemed, would be an afterthought. That all changed at the age of 9 when Addison visited his doctor and asked with football being out of the question, could he wrestle. The answer of “yes” took the family by surprise. The journey into wrestling was about to start. The journey getting to that point was anything but standard. Very early in Addison’s life, the Courtney family found Dr. Alberto Pena on the medical path at Cincinnati Children’s Hospital. Pena specialized in the issues Addison was dealing with. There, Pena was joined Dr. Mark Levitt and a specialized program was created for children with Addison’s condition. “After being evaluated by these specialists we were referred to additional physicians, one most important being Dr. Shumyle Alam who would go on to perform the most complicated of Addison’s surgeries,” said dad. The surgeries were indeed complicated. Four major reconstructive surgeries that included two lasting more than 12 hours. The surgeries required the still young family, including daughter Gracie, to spend frequent time in the hospital and the Ronald McDonald House more than once. The Ronald McDonald House allowed the Courtney’s to spend time in a home-style setting and spend time with Addison at the hospital – bringing as much normalcy to bear in a situation where normalcy was scarce. A lot of the early stuff, Addison doesn’t recall. However, it was only a matter of time before he was at an age when he realized his life was different from others. “I think I was about five years old when I realized there were things going on because of them doing a medical procedure on me. I remember always being at the doctor, but when I was old to recall the procedures that’s when I realized things were different,” said Addison. In the end, it all of the surgeries and all the time on the medical front proved beneficial. The doctors had managed to give Addison the ability to carry out things most don’t think about in an artificial manner. For the most part, things have gone better than maybe some expected as Addison progressed into a teenager and high school student. The routine, unfortunately, changed just before the Indians’ first wrestling tournament this season. “We noticed a disruption to this routine and we are currently trying to restore it back. At this point he is having symptoms of prolonged cramping mixed with intense abdominal pain,” said dad, who said it’s possible a gastrointestinal virus has thrown everything off. In wrestling, the athlete knows his body better than anyone in most other sports. That, along with his lifelong situation, let Addison Courtney know something wasn’t right. “(The pain) started toward the beginning of the school year. 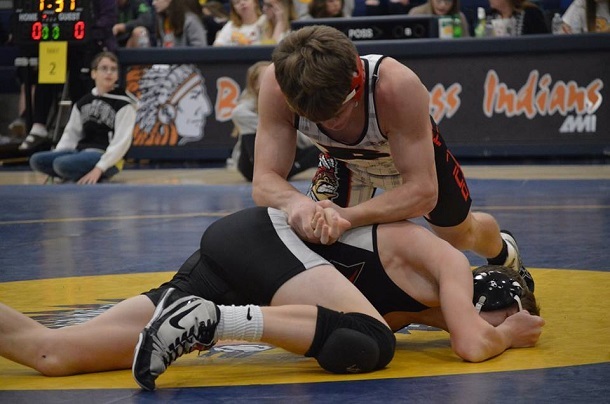 The real pain started a couple of weeks into wrestling practice,” said Addison, who is wrestling in the 138-pound classification. “I’ve been doing what I can and in the meets I’ve competed in I’ve just tried to push through the pain. I’ve been used to stomach pain, but this is a lot more intense. Until then, there’s an exercise of caution. That includes sitting out of tournaments as needed until the family, the son and the medical staff feel comfortable with the situation. There’s a reason Addison is determined to get back to full strength. When he was told at age 9 he could wrestle, father and son began preparing to get onto the mat. Addison now had a chance to compete and, even better, follow in his father’s footsteps. The results were not spectacular in the wins and loss column. He lost most of his matches. Instead of complaining, Addison and his father ramped it up. “The following year, we flew out to Boise, Idaho to do additional training with Ivan Ivanov in Bulgarian bags. Ivan was the US Greco Roman Olympic coach during the time my youngest brother Jeff was on the Olympic team. After that, Addison’s passion for the sport continued to increase,” said Chris. In middle school, Addison Courtney joined the team. He got better to the point where he would win the Mason Dixon tournament. He got better to the point where he won the Junior State Tournament in his eighth grade year. 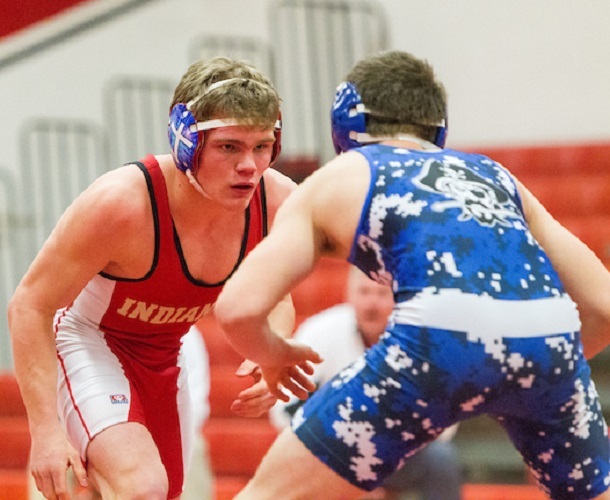 Addison wasn’t just thriving, but he had his wrestling family – a literal wrestling family in his uncles, grandfather and dad, Fairmont Senior cousin Zach Frazier – sharing in the joy taking place. The joy was so great the family created Training Traditions LLC. The excitement wasn’t false. It was real enough that Chris and his brother Ryan decided to apply for the head and assistant coaching positions, respectively, at Bridgeport High School. 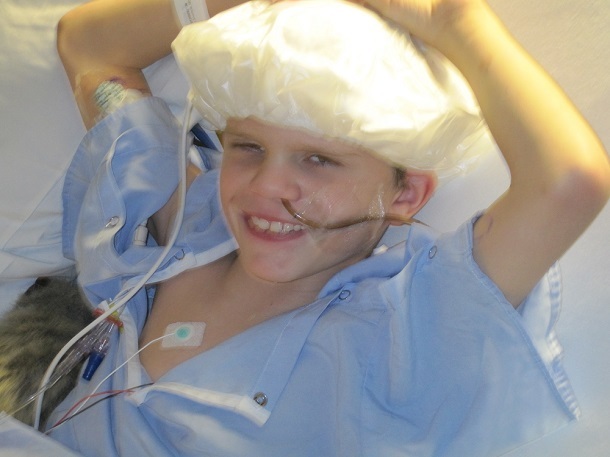 Therefore, the courage of a 9-year-old to ask his surgeon if he could wrestle has created the snowball effect of where Bridgeport wrestling is today. At the start of the year, Addison’s goals were set on the state tournament, placing and perhaps winning a title. Long-term goals included competing in college. The college goal, at least for the moment, is on hold. Dad and mom would like to see him there too. “My plan for his return is based on getting him back to normal first,” said Courtney. 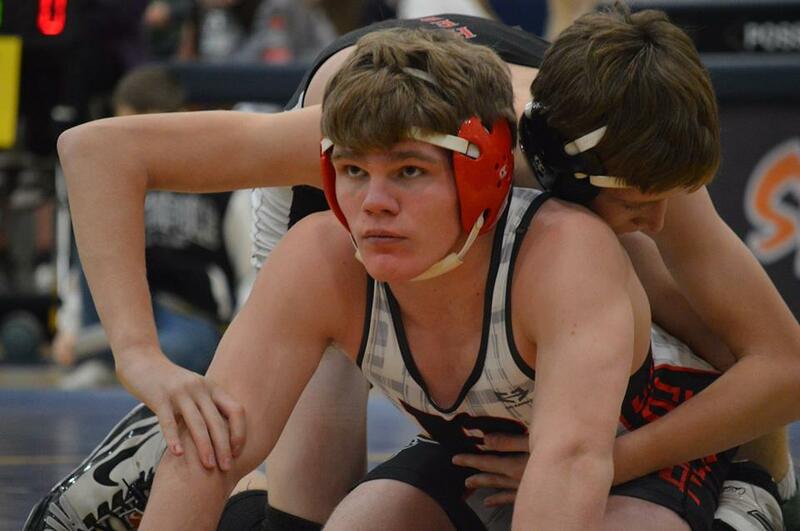 Here’s hoping normal returns to Addison Courtney in school, in wrestling and in life. Regardless of how things go from this point, he’s already accomplished a goal without even knowing it. 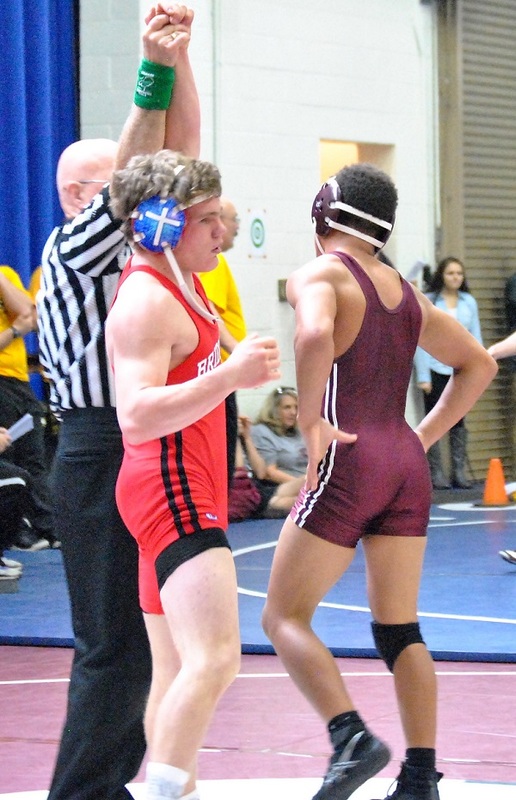 Well before the first matches at this year’s state wrestling tournament, Addison Courtney has shown what a winner is. Because of that, he’s already a champion. 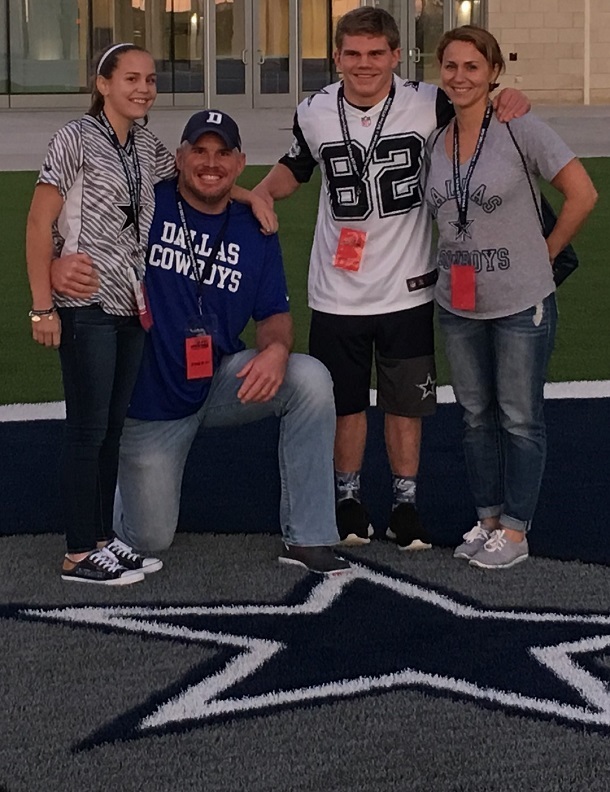 Editor's Note: Along with the various wrestling photos, a young addison is shown during one of his many surgical procedures as a youth, while he's shown with his family sharing their love for the NFL at the Dallas Cowboys facility. Non-wrestling photos courtesy of the Courtney family.